These are tough roles; the characters proudly sing about how bland they are. 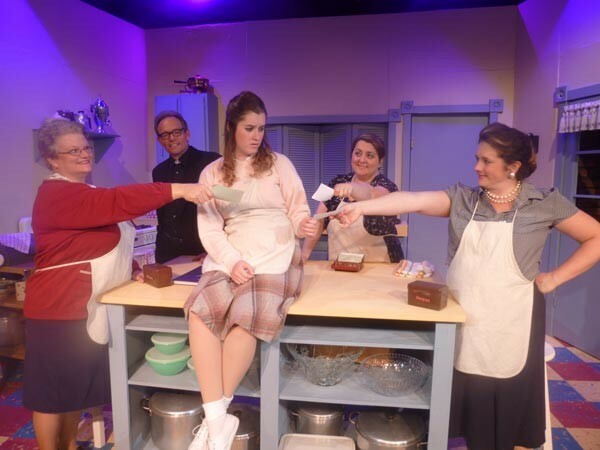 South Park Theatre presents the local premiere of Church Basement Ladies. Pittsburgh, say hello to an entertainment juggernaut. In 2005, a musical called Church Basement Ladies opened at a Minnesota theater and became an immediate box-office bonanza. 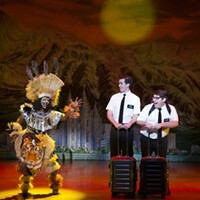 The show — and its three sequels — are still running, and there have been hundreds of sit-down productions as well as tours all over the Midwest. And I bet you’ve never heard of it. We’re in the basement of a Lutheran church in 1960 Minnesota. Four woman cook their way through various functions, i.e. wedding, funeral, fundraiser, while bonding over lefske and lutefisk. The plot happens when the church furnace breaks. No, really, that is the plot. Jim Stowell and Jessica Zuehlke adapted the script from a book called Growing Up Lutheran, by Janet Letnes Martin and Suzann Nelson, and Drew Jansen supplies the music and lyrics. If you ever wanted to know what it was like to be a Lutheran of Norwegian descent living in Minnesota in 1965, have I got a show for you. It would be so easy — in my jaded, bitchy way — to dismiss this featherweight, cloyingly sentimental show as ludicrous piffle. But if Brexit and the rise of Donald Trump has taught me anything, it’s that there’s all kinds of people in the world, most of whom I’ll never meet (and whom I’m not sure I want to), but their realities are as real as mine. Church Basement Ladies is hardly my kind of theater, but, given its enormously successful history, it’s somebody’s. And — and this is very important — there’s more of them than there are of me. The South Park production, it must be said, doesn’t make the strongest case for the show. I don’t like to recommend banned substances, but everyone involved needs a fistful of Black Mollies — the pace was nonexistent, and you could drive a truck through the pauses. I realize these are tough roles; the characters proudly sing about how bland they are. But director Rick Campbell needs to find ways to counteract that. Musically, it’s a little brighter. 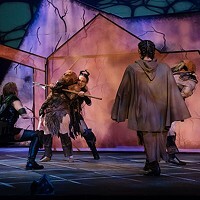 The cast — Christine Elek, Meghan Child, Kathy Hawk and Alexis Hawk — are pleasant singers (although there’s a little too much “head voice” in the mix) and seem considerably more comfortable during the musical numbers.